Churches can be complicated things. Even a small church of 80-100 people can have many aspects to it: preaching and leadership teams, music groups, youth and children’s ministries, small groups, and so on. Trying to maintain the day-to-day running of all these aspects is one thing, trying to make sure you are being faithful and effective as a church in these areas is another thing all together. If only we had a few questions that we could ask of ourselves and our churches regularly (weekly, even) that would help us see the extent to which we are being faithful and effective as Christ’s body on the earth. Often, our evaluation of the faithfulness and effectiveness of our churches either gets deferred much longer than it should (sometimes indefinitely) or it happens according to worldly wisdom (what draws large numbers, what feels right, what have we always done, etc). This is not surprising. As I have said, churches are complicated things and so evaluating them can be a complicated process that we either put on hold or we look to the world of business and productivity to make sense of it all. Evaluation of our churches and our ministries needn’t be such a complicated affair. Heart-searching, yes… complicated, no. In Revelation 1, Jesus gave his good friend, the Apostle John, a glimpse of Jesus as he truly is this side of his ascension. Jesus is mighty, powerful, wise, holy… and he is walking among his churches and he is holding their spiritual messengers/leaders in his hands. What better person to give a true and honest assessment of the faithfulness and effectiveness of God’s people?! In Revelation 2-3, Jesus did just that. He sent letters, via John, to seven churches in Asia minor (what we now know as Turkey). These seven churches were both actual churches in those places (you can visit the ruins of each of these seven cities) but also representative of the church universal – the strengths and weaknesses they displayed cover common variations of church faithfulness and effectiveness that have been (and will be seen) throughout history. Reading through the seven letters, there seems to be three main issues that appeared in one form or another: the issue of love, the issue of life and doctrine, and the issue of persevering faith in suffering or even prosperity. For each of the seven churches, these issues manifested themselves in subtly different ways but the key issues were still there. If we phrase these issues as straightforward questions, then we have a simple means to evaluate our churches and our ministries. How are you demonstrating love for God and love for other people? How are you holding to sound doctrine that shows itself in how you live? How are you confessing faith in Jesus despite prosperity or suffering? Take Ephesus, for example (Revelation 2:1-7). They were holding fast to sound doctrine by testing any who claimed to be apostles. They were persevering in faith despite threats from others (presumably the pagan silversmiths, see Acts 19:23ff). Yet they had no evidence of demonstrating an active love for their ‘first love’: love for God and love for his people. With regard to their doctrine and persevering faith, the Christians in Ephesus could be greatly encouraged. With regard to their love for God and love for others, this was the area in which they needed to be challenged and corrected. Alternatively, take Pergamum (Revelation 2:12-18). They were clearly persevering in faith in a difficult place indeed. Yet, their doctrine had begun to slip and false teaching that was leading to sin had begun to creep in. They needed to strengthen their doctrine and correct their wrong living without wavering in their perseverance and faith. We must not stray into wrong religion here. The most important question we can ask ourselves is this: are we still confessing Jesus as LORD and trusting in the cross and resurrection of Jesus Christ (Romans 10:9). We are saved by grace, which is a gift of God, and we are saved for good works, not by them (Ephesians 2:8-10). Likewise, we must not deceive ourselves. This is not a self-evaluation, but rather Christ’s evaluation that we can replicate for ourselves. The two are very different. One requires submission to ourselves as the highest authority, the other requires submission to Jesus as this authority. Submission to Jesus requires submission to what he has said in his Word, as given to us in the Bible. 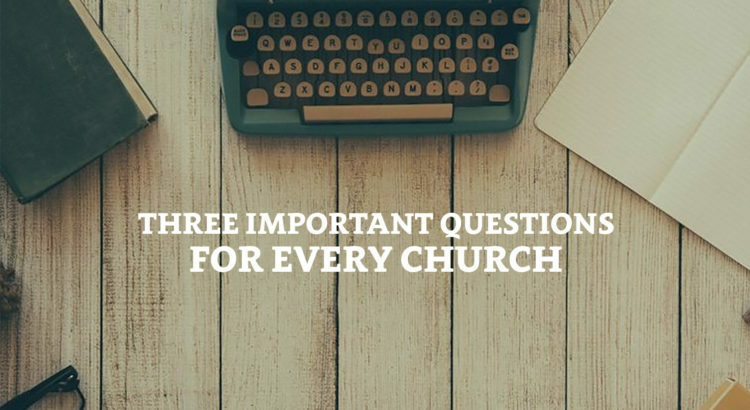 I hope that you can see how these three questions are so helpful for determining a simple but effective assessment of our church. So how can we put this into practice? If you are a member of a local church, don’t make the mistake of jumping directly to asking this question of your local church apart from yourself. Unless you are in a position of biblical authority and influence in the church, the only person that you can truly ask these questions of is yourself. That said, these three questions are also helpful for getting an idea how faithful and effective our families and friendship groups are in Jesus’ eyes. If you are a someone in a position of authority and influence in the church (particularly if you are a minister, elder or pastor), these questions are helpful in getting a sense of what teaching is needed, what truths need re-affirming or re-stating, what patterns of life or behaviour need correcting, and what encouragement and.or challenges need to be given. How faithful and effective is your church? How faithful and effective are you as a Christian in your church? Why not take a few minutes to answer these three questions for yourself and find out.